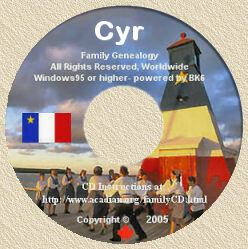 Acadian Genealogy Homepage; CYR Plantation in Van Buren, Maine! Click here to view great CYR gift ideas! The Acadian Story...from France to the CYR Plantation. The name "Acadian" was given to those early French settlers who migrated from France to the colonies of New France, now known as the Canadian provinces of Nova Scotia, New Brunswick and Prince Edward Island! From early time on, the French and the English could never settle its boundaries, causing great difficulties between the two parties. In 1605, the first of what was to be many new French settlers, arrived in Port Royal. They worked hard, tilling the soil and erecting dikes to maintain the water levels high. Within a matter of years, the population there grew significantly. With patience and devoted time, Port Royal became a prosperous agricultural district. The women played a great part in the lives of the new Acadian settlers. They could spin and weave wool, cook, sew and do light work in the fields. They would often gather at someone's house and enjoyed singing, dancing and exchanging jokes while they worked, and were always ready to lend each other a helping hand. They were very pious and they, along with their husbands, believed in peace, tranquillity...and equality. The year 1713 marks the beginning of trouble for the Acadians. The Treaty of Ulrect of that year, gave the Acadians the right to practice their religion any way they wanted...but only as long as it followed the letter of the law of Great Britain. The Acadians decided they would rather leave, than have to follow such rules however, they did not leave then, because of complicating factors. Meanwhile, the Governor, realizing that if the Acadians left, it would strip its agricultural industry, its habitants and its Indians which engaged in considerable trade with the British, was hesitant to take a firm stand. In 1717 the Acadians, concerned over their safety from the Indians and still wanting to leave, offered an oath of allegiance to the British Crown, providing they would be exempt from fighting the French or the Indians, and demanded British troops for protection. It became a major debate! Finally in 1720, Colonel Phillips the then Governor, proclaimed that the Acadians must make an "unqualified" oath of allegiance to the British Crown, or leave the country within three months...without selling, disposing of, or taking any property with them. The Acadians refused, saying such an oath, without reservations, would bring the Indians down on them. By 1730, the Acadians were known as "French neutrals". For a period of time, their communication with the British improved, but in 1744, France and England were again at war. The Acadians in New France were unprepared for hostilities, but voluntarily helped rebuild forts. Despite four invasions by the British, the Acadians stayed-out of the fighting and this forced the English to review their policies towards the Acadians. Although the Acadians remained neutral during the war of 1744-1748, the English still regarded them as being sympathetic towards the French. In 1750, the Acadians asked permission to leave Nova Scotia, but the then Governor Cornwallis, refused them, stating..."passports cannot be issued until peace and tranquillity are re-established in the Province". For the next four years, the Acadians lived peacefully and worked vigorously, and with enthusiasm, to provide enough grain and meat for the colony. On June 2, 1755 the Acadian troubles accelerated when a force of British soldiers raided Grand-Pré, seizing everything they found for their own use. The governor informed the Acadians that if they desired to show obedience to the British, an oath must be taken immediately. They were given 24 hours to make their decision. In reply, the Acadians advised they had no intention of taking such an oath and they were therefore arrested and confined. Governor Lawrence issued orders at Beausejour, Pitziquid and Annapolis (where my own mother, Annie Ouellette, was born), to prepare deportation of the Acadian population of Nova Scotia ("Le Grand Dérangement"). Colonel John Winslow received the orders and used the local church as his headquarters and, since the priest had been arrested, his house (the rectory) was used to lodge the troops. He ordered all sacred objects be removed from the church and his troops pitched tents on the church grounds. The Acadians remained calm and quiet, although they were restless. The grain stood unharvested in the fields and this, together with seeing how their church was being used, caused them to brood, sadly. "it is ordered that your lands and tenements, cattle of all kinds and livestock of all sorts, be forfeited to the British Crown, along with all other effects, saving your money and household goods and you, yourselves, be removed from this Province. That the whole French inhabitants of these districts be removed and, I am, through his Majesty's goodness, directed to allow you liberty of your money and household goods, as much as you can carry without discommoding the vessels you go in. I shall do everything in my power to ensure those goods be secured to you and you are not molested in the carrying of them, and also that the whole family shall go in the same vessel and make this removal as easy as his Majesty's service will admit, and hope that in whatever part of the world you may fall, you may be faithful subjects and a peaceable and happy people. I must also inform you, that it is his Majesty's pleasure that you remain in security under the inspection and direction of the troops that I have the honor to command". Photocopy of authentic signature of Pierre [Sire] Sirre, provided by Stephen A. White of the University of Moncton. Original document is contained in the Leneuf Papers stored at the Canadian National Archives in Ottawa, Ontario. The Acadians were aghast that they would actually be removed however, deportation plans were immediately put into action ("Le Grand Derangement"). The Acadians of Chignecto, ignored the orders and fled to the woods of what is now known as the Canadian province of New Brunswick. The villages of Chipody and Petit Codiac were set on fire by the British troops and the Acadians, angered by such destruction, attacked killed wounded 29 soldiers. The Acadians from Cobequid (Truro), fled to the Isle of St. Jean (now Price Edward Island). By September 7, 1755 five British ships had arrived to carry out the deportation orders and, with bayonets fixed, the soldiers ordered the men on a ship, separating them from their families. This caused anguish, and a sorrowful procession a mile-and-a-half long, at the embarking site of Gaspereau River. Ninety men were brought to the ship and kept aboard until final embarkation in October. Relatives were allowed to visit them daily. The final embarkation of the Acadians began on October 8, 1755. The women boarded in great distress, carrying their children in their arms. Others carried their disabled parents in their carts, moving with great confusion and making a scene of woe and distress.. It took 29 days for the Acadians to board the ships and finally, on October 27, 1755 a fleet of 14 vessels sailed carrying at least 6,500 Acadians on crowded decks, leaving behind their half-burned homes, livestock, crops and many personal possessions. "Le Grand Derangement" continued for more than eight years, involving some 14,000 Acadians. In 1763, when Britain and France signed a treaty of peace, 2,000 Acadians were left in France. It was a severe blow to the Acadians, having to leave behind the land they had worked for a century. The separation of families and dispersing to foreign countries...whose people were unwilling and unprepared to welcome them...was inconsolable. For example, Connecticut was the only American colony which had been informed of the arrival of the Acadians. Virginia refused 1,500 Acadians, so they had to be transported to England. Boston received 2,000, New York 200, Connecticut 300 and the remainder were distributed along the Southern part of the United States. The Acadians were given little hospitality and, at most locations, were met with distrust and contempt. Four ships _never_ reached their destination...one sank in a storm, two were driven by the winds to San Domingo and the third was captured by the Acadians and returned to the St. John River of New Brunswick. There they were met by other Acadians who had fled to the woods at the time of deportation, but, although they were "free", they faced great hardships and miseries. They had nothing to re-establish themselves...no tools, no money and no education. In fact, all they had was their religion and French ancestries. And, having lived (on the run) for nearly half of a century by hunting and fishing, they had lost their ambition and art of agriculture. The Acadians of the lower St. John River area, were of service to the English Canadians and were a great help to the governor of Quebec and Halifax, carrying the mail and protecting all lines of communication between the two capitals. The Acadian Settlement in the lower St. John, was already flourishing at the time of the American Revolutionary War. In 1776 the Acadian land was again seized and deeded to the Loyalists who, without pity, evicted the Acadians. It is however encouraging to note that two Loyalists, Edward Winslow and Ward Chapman, showed some interest towards the evicted Acadians and obtained land grants on their behalf, from the New Brunswick government. Fifteen Acadians were granted deeds to farmland in an area where the English had a majority. In July 1783, a military commander had a committee to inspect the Upper St. John River area and found that the colony of Springhill (near Fredericton), was the most prosperous Acadian settlement of the area. There were 61 families with a total population of 357 inhabitants. Regardless of all the help the Acadians had given during the War of Independence, Governor Carleton confiscated their land and gave it to the Loyalists. We must remember that the Acadians had taken the oath of allegiance, without reservation, and had to remain faithful to Britain as they had promised. But as ever, the English always came first when, in their opinion, the interest of the fatherland was concerned. In 1785, the Acadians sent a petition to the officials of Quebec and New Brunswick, to obtain land in the Madawaska area. Twenty-four Acadians and Canadians asked land grants in Madawaska, a mile-and-a-half south of the Madawaska River Falls. The Acadian petitioners were: Louis Mercure, Jean Martin, Joseph Daigle Sr., Joseph Daigle Jr., Daniel Gaudin, Simon Martin, Paul-Francois CYR, Joseph CYR Jr., Pierre CYR, Jean-Baptiste CYR, Firmin CYR, Alexandre Ayotte and Francois Martin. The Canadian petitioners were: Pierre Duperry, Jean Lizotte, Pierre Lizotte, Augustin Dube, Robert Fournier and Louis Sansfacon. Another petition found in the Canadian Archives, was addressed to the Governor-General of Canada. This petition was signed by Jean-Baptiste CYR, his wife Marguerite Cormier and his nine sons, Pierre, Olivier, Francois, Antoine, Paul, Jacques, Joseph, Firmin and Jean-Baptiste CYR Jr., as well as Alexandre Ayotte, Zacharie Ayotte, Joseph Daigle Sr., Joseph Daigle Jr., Olivier Thibodeau and Louis Sansfacon. A few days after receiving a promise of land, Jean-Baptiste CYR held a meeting at his residence, where he decided that half of the colony would go to Madawaska and the other half would be divided among Amon, Memramcook, Miramichi, Tracadie, Caraquet and Bathurst. In June 1785, a number of families left Fredericton and vicinity by canoe, to go up the St. John River, taking only their bare necessities of clothing and food. After ten weary days they came upon a peak of highlands which dominated the valley of the Lower St. John River and from there, they could see a broad valley with hills on both sides. They were certain they had reached the door of the promised land and there, they took a much needed rest. They continued their journey two-and-a-half miles south of the Malecites village and set foot on the elevated flat, a short distance from the present-day St. David church in Madawaska, Maine. The Indians were reluctant at first, but soon made friends with these new settlers. The vast territory between Grand Falls/Grand Sault (my home town) and Lake Temiscouata, has always been known as the land of the Malecites. During the first summer, the pioneers selected and cleared their land. The first year they all lived as one big family, sharing everything. On the south bank of the St. John River were found the families of Pierre Duperry, Paul Potier, Joseph Daigle Sr., Joseph Daigle Jr., Baptiste Fournier Jacques CYR, Baptiste Thibodeau and Louis Sanfacon. On the north bank, near the Indian village, the families of Louis and Michel Mercure were found. Near the Iroquois River, were Olivier and Pierre CYR. By 1787, twenty chimneys could be seen, indicating the colonization of the Madawaska area, was growing. The new settlers had to wait five years to receive their land grants and the following conditions were imposed on the pioneers, before the actual titles to their farmlands were granted: obliged to pay two shillings per 100 subsidized acres on St. Michael's Day (September 29th); three acres of farmland had to be cleared within three years on the total 50 acres granted; and a dwelling of 15' X 20' had to be constructed; all swampland had to be drained. The first grants in the Grand River (Van Buren, Maine) south-bank area, were awarded to Augustin Violette, Francis Violette and Joseph CYR Jr. This is about two miles north of the present town, where the first St. Bruno church was built and a (Acadian) cross was erected as a reminder of the old church and cemetery. Additionally, grants were awarded to Hilarion CYR and Joseph Soucy, on the north-bank of the Grand River (St. Leonard, New Brunswick). The colony was making rapid progress, the clearing of land was way ahead of schedule and the crops were in abundance. However, the new settlers were forced to leave the river shore in the spring and move to higher ground, because of flooding. As more people came in greater numbers to the region of Madawaska, it became necessary to put in place a Civil organization in order to have control of the population. As well, Military and Religious bodies had become necessary, for administrative purposes. Lord Dorchester, Governor of Canada, sent word that he had appointed Captain Francis CYR and his brother Lieutenant Jacques CYR, as military officers for the Madawaska region and requested confirmation of his appointments. Because of the oath (to renounce the Catholic faith and declare idolatrous Catholic dogmas and creed) they would be required to take, other Acadians refused to accept positions in the office of Justice-of-the-Peace. Among the pioneers at the time, lived a teacher named Costin, a Scotch and Protestant who spoke and understood French and was well-liked in the vicinity. He was appointed Magistrate and, in 1825, converted to Catholicism. He died of old age, at Riviere-du-Loup. At the time, there was a great dispute as to which side of the river, the church should be built. The citizens of the north side (New Brunswick) signed and sent a petition to the New Brunswick governor, requesting the granting of Lot 24 of the Mazerolle Settlement for the purpose of erecting a public building. It is on this Lot that the Church of St. Basile, New Brunswick (where my wife's first cousin, Rev. Napoleon Michaud served as Pastor for some ten years), was built. Roads were built in the more populated areas of the settlement and, in 1792, the older roads were improved. Road Commissioners, Constable and Foresters were appointed by the government and relay stations were installed between Grand Falls/Grand Sault and Madawaska, for mail carriers and travellers. The double jurisdiction caused conflicts between the Provinces of Quebec and New Brunswick and in 1794, a commission was appointed by Great Britain and the United States, to study the contested boundaries. For a time, the men outnumbered the women and so the men had to travel to Kamouraska (Quebec), to find wives. In those days, all contracts were made orally...their "word being good as gold"! Because the colonists lost their crops two consecutive years due to floods, early frost and snow, the year 1797 was known as the "year of black famine". Many returned to Fredericton and St. Lawrence for the winter and those who remained behind, lived on game and herbs. Marguerite "Tante Blanche" Thibodeau, wife of Joseph CYR, worked feats of wonder, heroism and charity. She was known to many as the "protector"...the angel of the weak, the invalid and the hungry people of the colony. In the spring of 1797, Madawaska had its first resident priest, Father Francois Ciquart, who served as pastor, teacher, doctor, lawyer and judge to the colony. In 1820, the United States undertook a survey of census for the entire area and found a total of 1,171 inhabitants and 55 families. The American census-takers, who spoke and understood little or no French, "murdered" some of the French names. For example, Jean-Baptiste CYR was listed as "John Betishire"; David Le Sourd (a nickname for David) became "David Lewsure"; Benjamin Boucher became "Barnum Bushiere"; Honore Levasseur became "Honerd Levassus"; Anselme Albert became "Handsome All Bear"; Francois Cormier was listed as "Francis Carney". Is it any wonder that many historians experience great difficulty in tracing the family roots of these Acadians! A series of revolts, debates and demobilization between New Brunswick and Maine, brought the United States and England on the brink of war and, in 1827, troops were sent to fortify the town of Houlton (Maine) and to build military roads to the St. John River Valley. The Webster-Ashburton Treaty was the turning point in history, for the inhabitants of "American" Madawaska. The people adapted themselves very well under a new allegiance and many "Canadian" Madawaskans got a longing for the United States and migrated to the New England industrial centers. In 1838, Van Buren (Maine) and what was to become known as the CYR Plantation had its first church and resident pastor, Father Antoine Gosselin, who in 1839 recorded Van Buren as having 125 Acadian families. Christopher CYR, David CYR, Aimable and Pierre Ouellette, George and Augustin Madore and Joseph Lapierre Sr., are known to be among the CYR Plantation's first settlers. Christopher and son Andre were the very first settlers, in 1842-43. They came up along Hammond Brook and cleared a lot along the brook, built a camp and later obtained the grant of Lots 31 and 77. Many other CYR's followed and settled about five miles from the town of Van Buren (Maine) on Caribou Road, including Oliver CYR, David CYR, Alexis CYR and Francis CYR. Aimable and Pierre Ouellette are also known as early settlers on Lots # 28 and 74. Joe Lapierre came around 1849 and settled on Lot 18. After his family grew, Andre CYR was obliged to build a bigger house (still standing today) and the front part of the house is built of square wooden pieces 8" X 8". His great grandson, Abel, is still living on the old homestead and he is the one and only CYR living in the Plantation, today! "Hi: My name is Jeanne Cyr, I am married to James Cyr, the great great grandson of Andre Cyr who built the house in Cyr Plantation. I just want to let you know that Abel Cyr passed away and there are no Cyr living in that house that is still standing, and no more Cyr in Cyr Plantation, as we live in Van Buren (Maine) and we are the only ones in the area. Jeanne"
The CYR Plantation, named after the numerous CYR's who lived in the vicinity, was organized as a Plantation in 1870. It is a full township with an area of 24,547 square feet, equal to approximately 6.5 square miles. It is situated in the northeastern part of Aroostook County, 70 miles north of Houlton (Maine). Between it and the St. John River on the east, is Hamlin Plantation and on the north, the town of Van Buren, Maine. The Hammond and Violette Brooks, form the northern and eastern boundaries and Railway Brook, running south into the Little Madawaska Brook, forms a part of the western boundary. The township is without high hills and its soil is reddish, yielding good crops of wheat, oats, buckwheat and, its famous potatoes! In 1870, the settlement was principally on the stagecoach-line from Caribou to Van Buren (Maine), known as Caribou Road. Throughout the century, there were people living on rear lots of the CYR Plantation. The roads on the west side are today known as the Abel CYR Road, the Michel Lajoie Road, the Onezime Ouellette Road, the Cross Road, the LaPlante and the St. Mary Road. On the east side are the Edmund Ouellette Road, the Madore Road and the Lavoie Road. Unfortunately, the Madore Road and the LaPlante Road are the only back roads left today, being located in residential areas. At one time, two sawmills and a starch factory were in operation on the CYR Plantation. The starch factory, owned by Honore Gagnon...a Democrat, played a political role in the Plantation. Democrat and Republican political parties, were strong in the area and each party had their chosen area to deal with. The Republicans had their starch factory in Hamlin (Maine), owned by the Martins. Each party had their own Hardware Store in Van Buren, Maine. 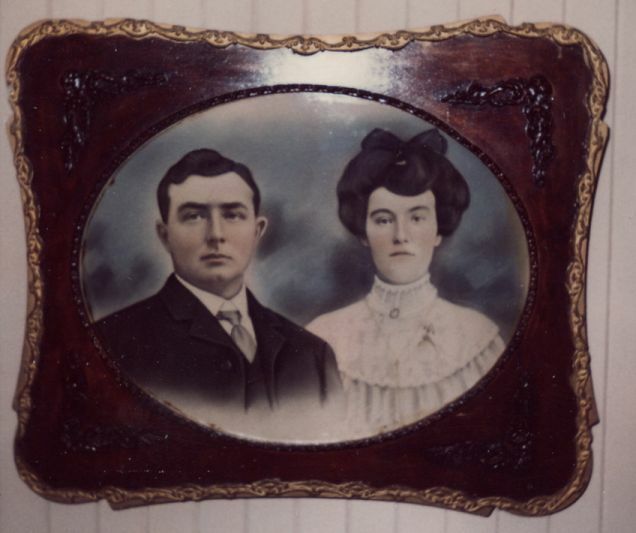 For a period of time, Aimable Ouellette and David CYR, were lumber dealers in the area. In 1870, eleven of the twenty-five men sent to the Union cause in the war from the CYR Plantation, were lost. While the majority of the people were Catholics, in 1870 the free Baptists erected a small church on the Plantation. Back then commuting to church was quite different from today! They used to walk or ride buggies pulled by a horse and, in winter, they had to shovel their way through. They erected crosses in different places along the route and, when it was impossible to make it to the church, they would perform their duties, gathered around one of these crosses. The population in 1870 was 356, in 1880 it was 558, but by 1970 had dropped to 150 due to the poor economy of the area. The total value of the CYR Plantation estates in 1870 was $28,066.00 and in 1970, $203,705.00. The tax rate in 1870 was .12 cents, which had increased to .126 by 1970. By 1922, there were six one-room public schools and 177 pupils attended school from 1st to 8th grade, with an average of 29 pupils per school. These schools were valued at $200.00 each. Today, potatoes are its main industry however the market has been quite low for many years and, having no other industry in the area, the people are leaving in search of better opportunity areas. It is sad to see the younger generation leave the old homesteads where good living had provided large families, happy homes, wide-open country fields, clean and fresh air, as well as water. The remaining families continue to work hard, to maintain the land of their ancestors. The following portraits, were photographers (by myself) on my Grand-Parents Wall.